The past four days have been very busy…I have been out of town and I’m still not back home yet. I’m so sorry that I didn’t get by to all of you at last weeks party, but I was busy planning and packing for my trip. I will be sure to check in with all of you this week to see what you have found while out thriftin! While I was in Atlanta I did manage to stop in a GOODWILL store and stop by a GARAGE SALE…I only found a couple of things and I will share them with you next week. I have been very busy working in my yard planting lots of new plants…this is one of my favorite hobbies…bad thing is that I only have a couple of pics of them to share with you at this weeks party….more to come later in the week. I found this planter at Garden Ridge last Fall at 90% off…got the flowers at our local Flea Market…paid $8.00 for all three of them! This urn was found at a garage sale for only $3.00…luv how it looks on one of my “chippy paint” tables in the screen porch! 1. Be sure to refer back to my blog so everyone can see who is participating today, and if you like, include the NTT button in your post (copy and paste the html code under the button…the button is located on my sidebar). Please make sure that you have put my NTT button or my blog name with a link on your post. I have seen that some of you have forgot to do this…so this is just a sweet reminder. 2. Please go and visit the other participates and leave a comment about their treasures and thrifty ideas…this is what makes the PAR-TAY so much FUN! What a great way to meet new friends. I’m having a GIVEAWAY that you don’t want to miss out on…so go here to enter! The $3 urn is fabulous and I love the pinks too! I wish we had a Garden Ridge here! I shopped there a lot when I lived in VA.
Oh, yes I love the urn! They are hard to find cheap. Very nice. Like the wire window boxes too. What a great find on that urn! Thanks Linda for hosting!~ I need to do my planters this week, been busy myself:)! Your pink flowers are super! 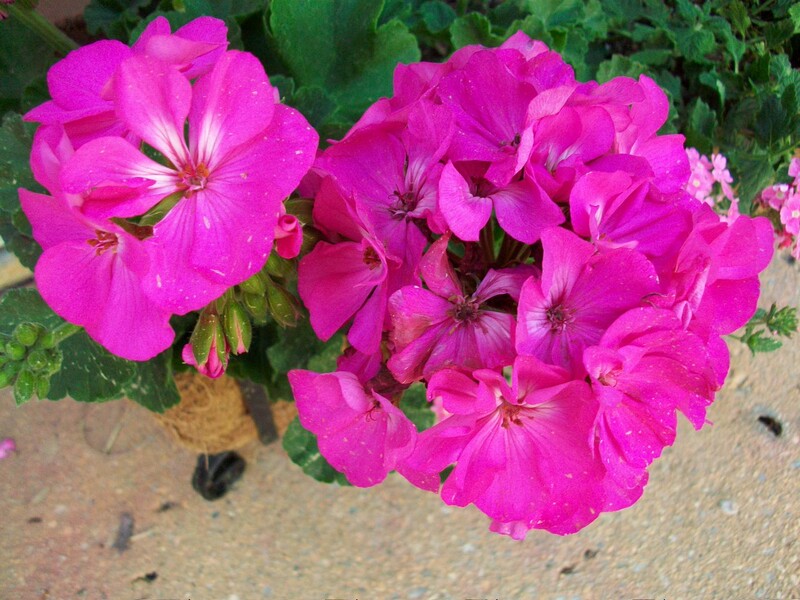 Love those bright pink geraniums! Great finds! 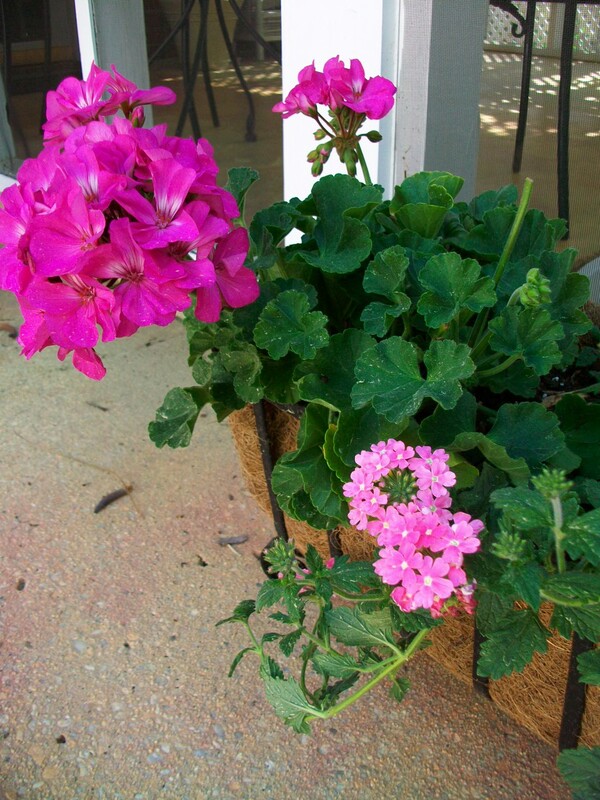 Gorgeous planter for 90% off and l-o-ve the bright pink geraniums! I like your new header too! Join me over at DirtyHands, Beautiful Life next Wednesday for my first "Shop Your House" Linky! Thank you for hosting, Linda! I always enjoy your parties. I love the pictures too! LOVE those pink flowers!! I need more pink in my yard. Thanks for the invite to the link party! Love your beautiful spring flowers. 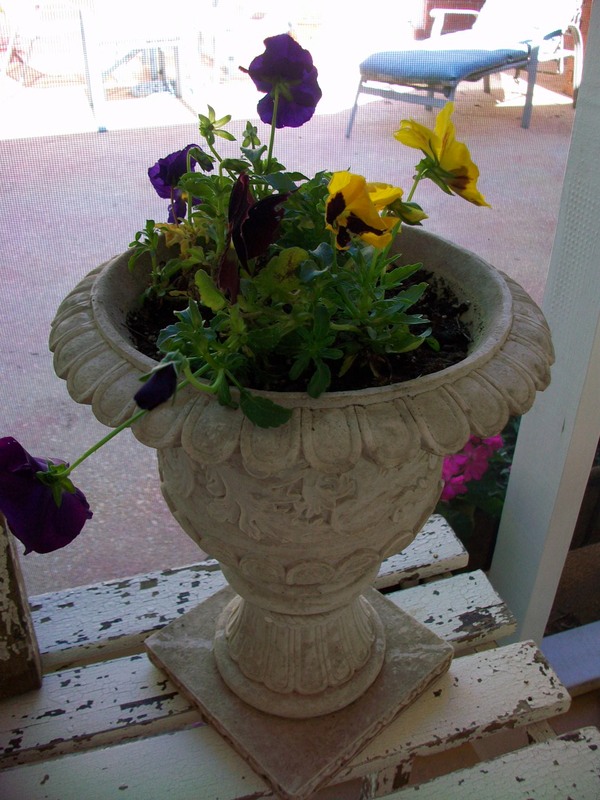 What great buys on your planter and urn. Love & blessings from NC! Love all the planters - they are so cheery! Thanks so much for hosting again!! I just LOVE your party!! Hi Linda...Thank you for visiting CollectInTexas Gal and inviting me to your Party. I hope everyone enjoys my Thrifted Texas Plates. Hi Linda! Thanks for stopping by Creating Balance and inviting me to your party!! And I'm a sucker for any kind of container---especially urns! And a $3 urn??? I'm so jealous! Love it! OH! And by the way...we'll be going back to Orange Beach in September, so you'll have to give me the skinny on the good thrift stores and flea markets to visit!!! Love your stuff, especially that urn! Thank you for hosting the Tuesday blog party and inviting me. I'll try to be here every week! Lots of nice planters! Love the wire one and such a good buy on the plants. The urn is very cool. LOVE your new header! Hello sweet Linda - thank you for hosting this fun party! I love your planters! And the flowers are beautiful. Thanks Linda, for coming by. I didn't get to link with you this week, but I probably will next week. I love your flowers and that planter was a steal. I didn't know you were just in Atlanta. Glad you had good weather here. Great bargains! And beautiful flowers. Love the flowers. Great find and price on the urn! thanks for hosting Linda, I've linked up for a second week, so much fun! Great finds, such a deal to pretty up the patio. Love the urn and your flowers are SO pretty! I have to get out to some sales so I can join your party!! What a great find on those planters. I love that style with the liners built in. I've never seen these but as window boxes but I love the little feet. The bright pink flowers are so pretty too! We were BOTH planting flowers this week!! 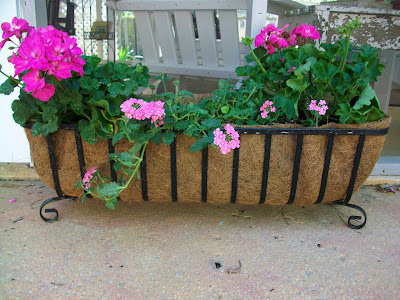 I ♥ your planters & that bright PINK! Too early to put out geraniums here yet but soon. Thanks for hosting the Nifty Thrifty Tues!! Linda, I remembered my project from last week I could link to your party. I spent yesterday afternoon planting, it is that time of year. I LOVE that urn, what a deal! The basket was a steal too. Thanks for hosting! Love the flowers...great finds, too! Very jealous of the urn, and $3? what a wonderful find. IF you find them around here, they cost way more. Linda! Love the planter and that urn!! $3???? AWESOME!!! Also love the pink!! Have a great week and thanks for hosting such a wonderful party!!! $3 for an urn??? Fantastic! Your flowers look gorgeous. Want to add your Nifty Thrifty Tuesdays Widget to my blog so I can play every Tuesday. When I copied and pasted url, it didn't work. Please check and let me know how to connect it. Thanks and have a wonderful day! My nephew lives in Atlanta! He plays for the Falcons! I'd love to visit him and see the sites soon! I'm secretly hoping one of his football buddies hires me to paint a mural, then I'll fly over on his dime! Ha! Love the geraniums. I need some red ones as I live in a red farm house. Had some last year, but they were annuals. You know the bright red ones? Just perfect! Hi Linda, I'm linking up to you late, but hope that's OK. Great party! I LOVE the wire baskets...they are always so pretty when filled with such pretty flowers! Thanks so much for sharing and for visiting my blog! I love all of your gorgeous pink flowers! You've motivated me to go get some plants tomorrow! Thanks for hosting...love it. I've completed the submission but it has not shown up...any suggestions? Sorry. It finally came up (twice) yikes!!! I'm so jealous of your great planter deals!!! They look beautiful! Thanks for visiting my blog--I've added my side table to your linky! So glad to find your blog. I live part time on Alabama Gulf coast---my favorite place! Hi Linda! I love all your flower photos from this post and todays posts. They are just beautiful. What a good deal on both the urn and window planters. Wow! I have just finally found a moment to begin enjoying all these fantastic Nifty Thrifty posts. Thanks for hosting such an enjoyable party! Checking in from the Shore! NTT Highlights...Do You See Your Name Here?